Define seven senses, including the lesser-known senses of body position (proprioception) and the sense of balance and movement (the vestibular sense). Explain the benefits of sensory play for child development. Identify components of a play area that is accessible, inclusive, and welcoming for children of varied abilities, and which will offer opportunities for supporting sensory and motor development, as well as facilitating positive social communication and active participation. 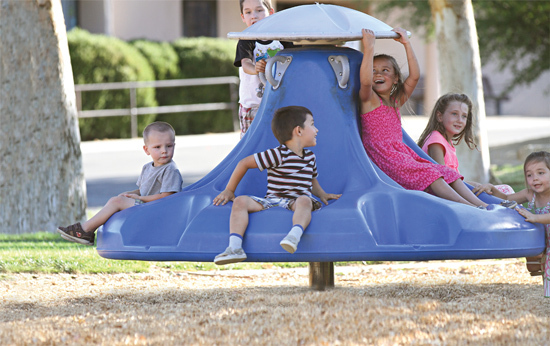 Specify playground equipment that creates sensory development opportunities for all children. 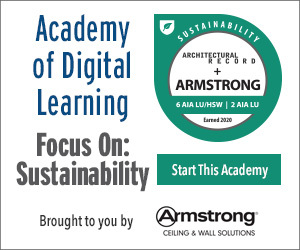 Describe several case studies illustrating how the landscape architect/designer specified playground layout and equipment to serve the needs of all children. The daily lives of U.S. children are changing dramatically, and not always for the better. The average 8- to 10-year-old spends nearly eight hours a day with a variety of different media, according to a study by the Kaiser Family Foundation. Older children spend even more time with cell phones, computers, iPads, video games, and television.i However, a sedentary lifestyle brings many concerns and risk factors, including significant limits on the chance for children to develop into balanced, confident, well-adapted adults. For children, time spent actively engaging all of the senses means better physical, cognitive, emotional, and social development. Outdoor play is perhaps the best and most natural way for children to use, develop, and optimize all of their senses, which in turn supports motor, language, social, and even academic skills in meaningful and productive ways. Architects and landscape architects play a vital role in providing children with interesting and stimulating built outdoor environments. Therefore, an increased understanding of the ways in which sensory motor development can be supported through play is a vital topic of consideration. In this course, we will explore the seven senses and the real-life impact that positive sensory experiences have on children. We will examine the sensory benefits that well-designed playgrounds offer to children of varied abilities, and aim to educate architects and designers on how to create and specify play spaces that can amplify these benefits. Finally, this course examines several case studies of well-designed playgrounds and how each piece of equipment specified supports the development of all children, including those with special needs. Architects and designers can play a major role in creating inclusive playgrounds that contribute to the positive sensory development of all children. From birth, we learn how to navigate the world through all of our senses. Whether children are climbing up slides, enjoying the “whoosh” of flying high on swings, feeling sand fall from their friends’ hands to theirs, hearing friends call out for them to join them in play, or smelling the rain on the playground, all of these activities feed vital information to their brains and form lasting impressions. While play can seem simple and natural, it is surprisingly complex in terms of the ways in which it supports positive growth and development. While play is beneficial for all children, using playground equipment can offer unique and impactful sensory experiences that are difficult for children to get through other forms of play. These intense sensory experiences can be especially important to the development of children with sensory disorders. Such playgrounds often become community centerpieces and sources of civic pride. While most people generally know about only five senses, there are, in fact, seven important senses that guide our actions through life. All seven senses work together, gathering input and feeding valuable information to the brain. 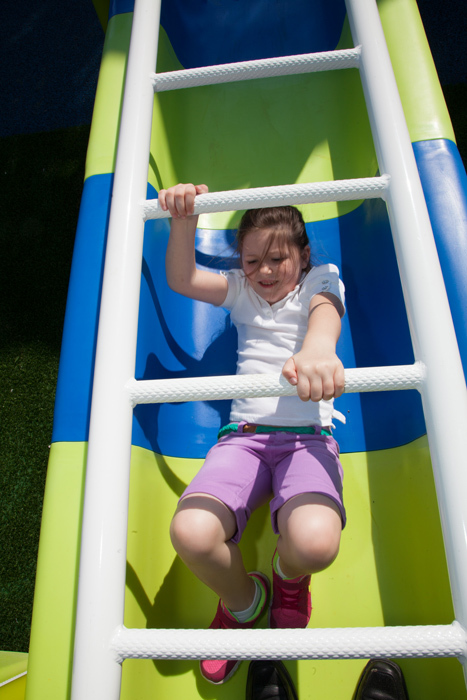 Through play activity in a well-designed playground, children develop all of their senses. That includes the five senses familiar to us (sight, sound, smell, taste, and touch) and the two most of us are unfamiliar with (proprioception and the vestibular sense). The five commonly known senses are familiar to us: sight, sound, smell, taste, and touch. All of the senses are important, though we sometimes underestimate or are unaware of how much we rely on them. For instance, while many parents understand the importance of singing rhymes or showing books to their babies, many are not aware of how critical the sense of touch is for guiding actions that lead to important life skills. Taking in information through the body’s largest organ, the skin, the tactile sense provides detailed information about the shape, size, and texture of objects. This sense offers information about the body and the surrounding environment, and is critical in development of body awareness and control of actions. Through manipulation of objects and experiencing different surfaces and pressures, children learn to coordinate motion. Play features, such as a sandbox, a water sprinkler, or an interactive play panel, capture a child’s interest in touch. Incorporating various textures, shapes, and objects is a great way to harness a child’s drive for tactile feedback. Varying the textures of equipment is another strategy. The inclusion of objects that children can manipulate and move with their hands also engages touch. Using different brightly colored components and designs with various patterns and textures and sounds engages both sight and sound. Visual and auditory inputs are also important in early childhood, and those senses develop in an integrated way with the primary senses, such that access to a varied play environment helps to further support healthy sensory integration. We also rely on two additional senses: our sense of position, called proprioception (pronounced: PRO-pree-o-SEP-shun), and our sense of balance and movement, called the vestibular sense. These are two critical, primary senses that also develop before birth and, along with the sense of touch, give us our most basic understanding of how we move and experience the world around us. Proprioception provides awareness of the position of our bodies. It helps us integrate touch with movement, allowing us to move effectively through an environment. Proprioception, as it develops, helps children to judge how much force to use, how far or near to place themselves in relation to objects or people, and how to use and move their bodies appropriately. Anything that stretches, pushes, or pulls on muscles and joints supports proprioception. Play equipment that involves activities such as jumping, pushing, pulling, and hanging nourishes proprioception. 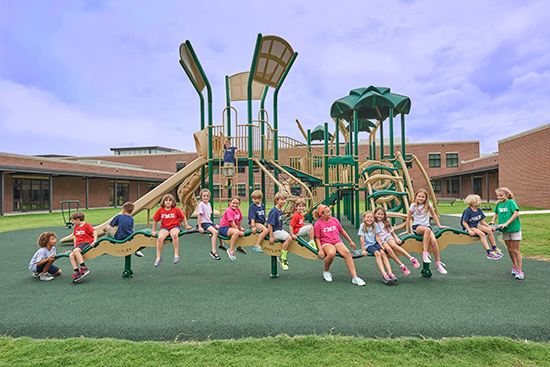 Swing sets, teeter-totters, and overhead ladders are examples of playground equipment that support this sense’s development. The vestibular sense provides spatial awareness though alerting and informing us about the direction, speed, and rhythm of the various types of motion we experience. This sense makes it possible for us to hold our heads and bodies up against the force of gravity, to keep our balance, to coordinate our eye muscles as our heads move, and to integrate the two sides of our bodies. The vestibular sense is the sense that drives our need to move throughout the day, whether we are young or old. Play equipment and activities that ask children to move in a rotary way, to balance, to spin, or to rock are ideal for supporting vestibular input. Movements that rely largely on the child for propulsion are also excellent. Any play that is bilateral, such as a climbing wall or jumping rope, also promotes this sense. Development of the senses happens through play. This piece of equipment sits on the ground, making it accessible to children of all ability levels. As children develop, their skills and abilities are built upon the ways in which all seven senses are working together and facilitating their ever-increasing interactions in the world. Through this dynamic process, sensory information blends with motor skills, communication abilities, social emotional awareness, and emerging intellectual functions in a process called sensory integration. The designer can create a playground experience that will be sure to facilitate positive development and participation for all children by ensuring that play equipment supports and challenges all aspects of sensory motor functions, as well as social, communication, and conceptual development. Even a small playground can feature equipment that engages all of the senses in positive and protective ways. For example, play structures can support the vestibular sense through products that provide opportunities for swinging, spinning, and moving through space. The need for proprioceptive input can be met through equipment that facilitates climbing, jumping, or crawling. Textures on surfaces can facilitate tactile abilities, and colors and sounds can also be incorporated in ways that can be both soothing as well as invigorating without being irritating or distracting. Many people equate accessible playgrounds with inclusive playgrounds. However, there is a distinction. 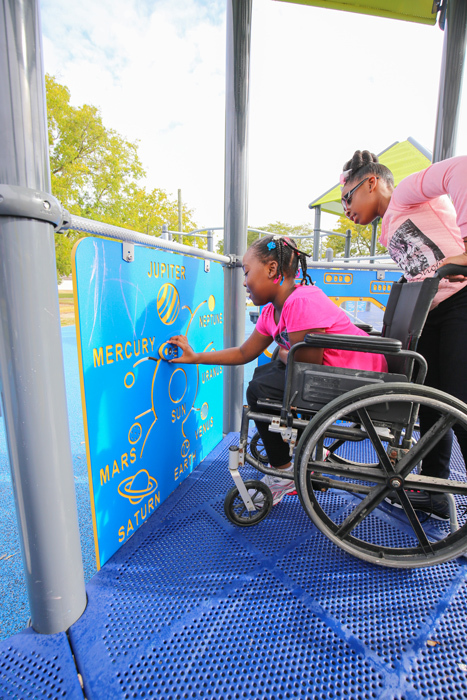 An accessible playground ensures that there is opportunity of access as required by the Americans with Disabilities Act (ADA). An inclusive playground goes further than simply providing access. Inclusive play means that children of all abilities play together side by side. The goal is to design a playground in such a way that all children have the opportunity to play together. Playgrounds should be accessible to all children and inclusive of all children.